Are Solar Panels Helping or Hurting? If you are considering a green remodel of your home, you might want to think twice about solar panels. Solar energy has been touted in recent years as the smartest form of renewable power, and it would be, if it weren’t for solar power’s predisposition for waste. Unfortunately, solar panels only have a life span of approximately twenty-five years, and now that our initial solar experiments are beginning to require replacements, electronic environmentalists are having a hard time figuring out how to recycle these old panels. Electronic waste is beginning to gain widespread attention as our society continues to mass produce and mass dispose of electronics. As of late, electronic waste, also known as electronic scrap, has been discarded to third world countries, where impoverished scavengers cut and burn old electronics to profit from the valuable materials within. In addition to putting their own health at risk by taking apart electronics without proper safety gear, these electronics hounds are endangering the health of their homes by releasing contaminants into the surrounding air and water. Solar panels have obvious benefits for the environment, and environmental scientists are currently experimenting with more and more uses for them, from heating conductors to cars. But on the downside, solar panels also contain the same harmful materials found in many electronics, including cadmium, silicon tetrachloride, selenium, and sulfur hexafluoride. Of course, green-conscious solar power producers are hoping to maintain the eco-credibility of their solar products. Fortunately, there is some motion towards solar panel recycling, but it is still very limited. Arizone-based First Solar, the world’s number one PV-cell manufacturer, has initiated an end-of-life solar module collection and recycling program. It currently recycles 95% percent of metal-rich semiconductor materials and 90% of module glass. But while the recycling program is free-of-charge, it is only applicable to First Solar products. This seems to be a common drawback with electronic waste recyclers. If they were truly concerned with the current state of electronic waste, wouldn’t they accept any form or brand of e-scrap? Yes, I’m more likely to buy new First Solar products, knowing they offer free recycling, but where does that leave me with my old, unusable solar panels? Unfortunately, First Solar does not expect much solar recycling business any time soon. Though the company believes the service should pick up within the next ten to fifteen years, they might also want to consider producing solar products with waste-conscious updates in the meantime. As one of the premier solar recyclers, First Solar needs to set an example for other solar manufacturers. The addition of solar recycling plants around the country will not only benefit our earth, but create countless jobs in a struggling economy. 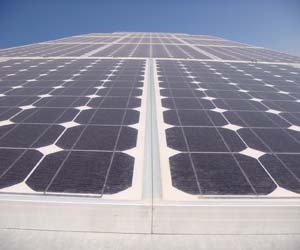 Solar panels also are embedded with numerous precious materials, including pure silver. An effective recycling system could assist in the protection of our Earth’s valuable natural resources. Creating a solar panel from recycled materials costs nearly the same amount as creating a solar panel from new materials and requires only one-third of the energy. With these statistics, it’s obviously time to start recycling solar panels. Let’s not hurt our earth with the very products we use to protect it. This entry was posted in Energy Efficient, Green Design Trends, Green Developments, News, Recycling and tagged electronic scrap, electronic waste, First Solar, solar panel recycling, solar panels on May 4, 2012 by Carol Morgan.